Pumpernickel is a traditional Westphalian whole-grain bread made from rye flour and coarse rye meal. According to the original German recipe, the bread is made mainly from rye meal, which is boiled for a number of hours to soften it. The dough is stuffed into a square bread form, then baked at 395°F (200°C). Afterward, it is steamed at 215°F (100°C) for 16-24 hours. This allows the ingredients to caramelize, giving the bread its dark brown color and its lightly sweet aroma and taste. Today, many bakeries add sourdough and malt to the dough. Also, the steaming time is often shortened, reducing the caramelization. To compensate, red beet syrup is added to the dough. Pumpernickel bread has a long shelf life. Wrapped properly, it can last for several months. When stored in a can, it can last up to two years. There are many differences between the American and German versions of pumpernickel bread. In America, bakers add coloring agents, such as molasses, coffee, or cocoa powder, to the dough to approximate the dark color of the German pumpernickel. Also, wheat (to provide structure) and commercial yeast (to quicken the dough's rising time) is added to American pumpernickel breads. American pumpernickel is most often baked without a bread form, resulting in a round loaf. Because of these differences, the American pumpernickel more closely resembles a dark rye bread. 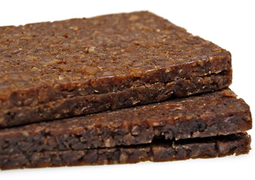 Where did the name "Pumpernickel" come from? (1) One explanation comes from the town of Osnabrück. During a famine in 1450, local officials ordered a special bread to be baked for the poor. The bread was named bonum paniculum, meaning "good bread." Since the people didn't understand Latin, they pronounced it "Bompernickel," then over time it became known as "Pumpernickel." Today, in Osnabrück, the Pernickel Tower (Pernickelturm) still stands. This is where the bonum paniculum is said the have been baked. (2) Another story that people like to tell is about a french soldier and his horse "Nickel." In the 18th century, as the frenchman was traveling through Westphalia, he was offered some dark bread by a farmer. He refused the bread and stated that it was "bon pour Nickel" - good for his horse, Nickel. (3) The third theory goes deep into German language history. "Nickel" was the shortened version of the name for Nikolaus. "Pumper" was the word for flatulence (gas). So, putting the words together, the word Pumpernickel meant Nikolaus' gas.